16 January 2015, at 11:34a.m. VIET NAM - Viet Nam currently has about 26.80 million pigs (up 1.90 per cent from this time last year). The national government had planned for this population to increase steadily from 2011 to 2015, however, the average annual growth reached 0.04 per cent/year (quite flat) and the total is about 17.88 per cent below what was planned for the five years-see table below. The lower number versus the target is due mainly to recent poor market pig prices; several farmers have quit or reduced inventory; many large- scale farms have been affected by the reduction in the herd that takes place because of devastating diseases such as PED and PRRS-these losses have been noted since late 2013. Recent profit losses along with the shortage of available funds and credit for the farmers from the banks are also factors to deter growth in the pig production business. Furthermore, pig production and pork production in Viet Nam is still mainly from small livestock farms that still account for 65-70 per cent of the pigs marketed and 56-60 per cent for the pork produced. These farms do not have the efficiency of large scale farms. As reported by Mr Nguyen Xuan Duong-Deputy Director of Livestock (Ministry of Agriculture and Rural Development Livestock) livestock production and markets in 2014 have been good with more benefits and returns to the farmers. Furthermore, he reports that livestock production growth has been quite high with an estimate of a 4-5 per cent increase as compared to 2013. Total pig production has increased nearly three per cent , with poultry up five per cent and, dairy up approximately 12 per cent . Feed production is up about six per cent . The average range for lean market pigs is from 47,000 to 52,000VND/kg ($2.22 /kg-$1.01 /lb. 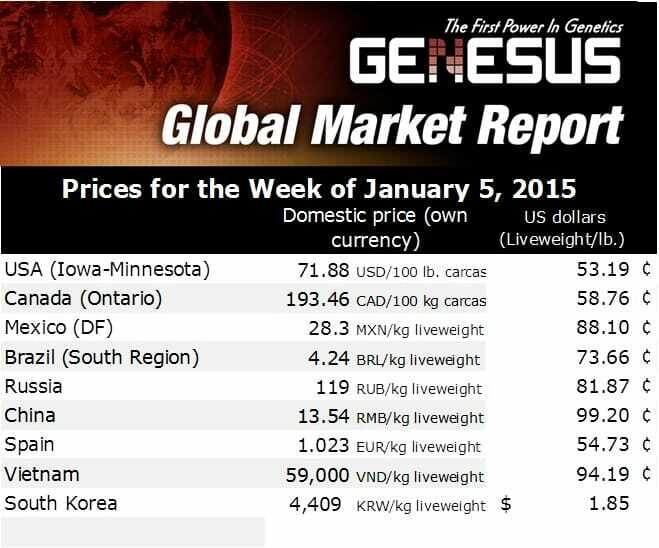 to $2.46 /kg-$1.11 /lb). According to the General Statistics Office, an estimated 2014 production of total meat slaughtered reached 3.4 million tonnes, up 3.1 per cent . According to the Department of Livestock Production, consumption of livestock products per person for 2014 was estimated at 50 kgs (110.2 lbs.) of meat from all livestock (up 1.4 per cent as compared to 2013). Last year, pork supply represented about 74.2 to 74.4 per cent of the total meat supply in Vietnam. Consumers also ate 88.7 eggs (up 2.7 per cent ) and consumed about 5.8 liters of milk (up 14.2 per cent ). Farmers feel that the price of feed should be lower than what it is currently being sold. Many feel that business agents who sell feed have intentionally kept the price high and that this has greatly affected the costs and profits of the farmers. According to calculations by some farmers, if the dealers had adjusted according to the prices stated by the Association of Vietnam Feed, then the farmers feel that they could have saved 100,000 VND/100 kg (220 lb) market pig ($ 4.72/market pig). Each year as TET approaches, the Country consumption of meat increases. As normal and at the end of 2014 and in the northern part of Viet Nam, the pork market became more active. The price of the market pigs on the large farms in the Hanoi region, jumped by 1,000 VND/kg ($ 0.05/kg-$ 0.02/lb) to 50,000 to 51,000 VND/kg ($ 2.36/kg-$1.07/lb to $ 2.41/kg-$ 1.09/lb). In the South and as consumers prepare for TET lunar year, the market has increased supply. Thus the market pig price remains stable at a higher price from 52,000 to 53,000VND/kg ($2.46/kg-$ 1.11/lb to $ 2.50/kg-$ 1.14/lb). Thus the price spread between the North and South regions is smaller and is at the lowest spread since early 2014.